Are you worried, how to manage your company employees’ tour and training details in easiest and accurate way? Employee tour and training management software creates tour and training records for HR representative and business leaders at one place. 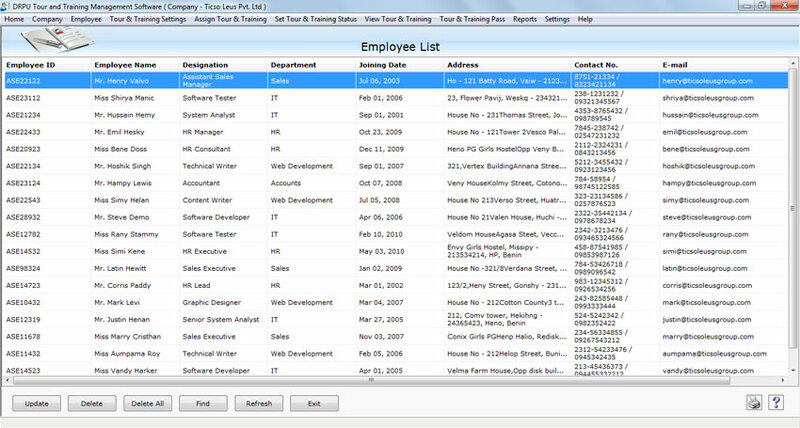 Tool easily maintains time consuming and complex tour/training employee details with Employee ID, Name, Designation and Department in comprehensive way. Simple and easy to use professional employee tour and training management utility that is capable to generate tour training passes during employee visits. Proficient Employee tour and training management tool maintains employee’s tour and training records with Tour Type, Training Course and Training Provider information. Maintain multiple company tour and training records at one place. Generate tour and training activities reports in easiest manner. Facilitate password protection option, prevents for illegal users to access/modify the software. 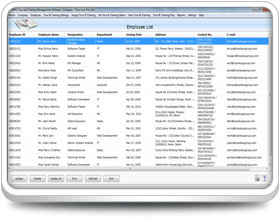 Advance data backup and restore facility to get back accidentally lost records. Provide data connectivity option to fetch records from different machine within LAN network. Generate various reports including Company Reports, Employee Reports, Tour and Training Reports. Facilitate print setting option to print generated reports of employees’ tour and training details. Provide preview facility even if you changes/modifies in already existing records before final print.